Spring is coming and it is time to buckle up and get ready for the big annual one-off cleaning of your London house. 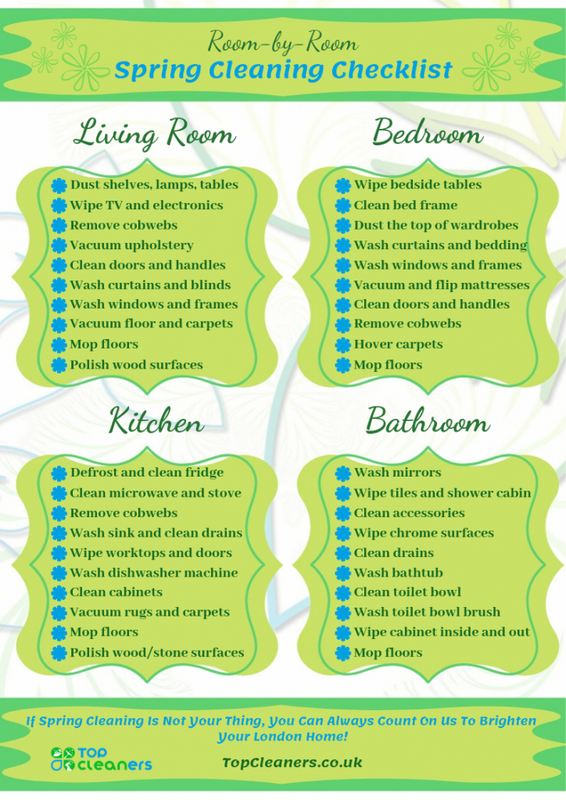 Yes, it may sound tedious and unnecessary but we assure you there are numerous health benefits in having a tidy home. Your concentration improves, you will have more energy and fewer lungs or skin problems. Not to mention your place will smell fresh and look even better. We have prepared some expert cleaning tips to help you get your house in order for the Summer. We will skip on the usually vacuuming and dusting and we will concentrate on the areas of the home, that really need to be sanitised this Spring. This is the room you spend the most time in granted you are sleeping most of it. You may think it is not so dirty and there is not much to do here but you can’t be further from the truth. Clean the top of your wardrobe. Yes, that part, that accumulates layers and layers of dust and you always put on hold when the time for cleaning comes. Well, not this time. Grab a damp cloth and wipe it thoroughly. You will notice how easily you will breathe afterwards. Declutter your drawers. Put away all winter clothes, donate the ones that you don’t wear and throw the pieces that are unwearable. The less you have stashed in the room, the easier it will be to tidy up the bedroom in the future. Your mattresses also need your attention. Even if you can’t see them, thousands of mites live inside your bedding, and that is not good. Vacuum your mattresses from both sides. If needed you can use a professional cleaning company to deep-cleanse them and wash all of the bacteria and small particles. The room with the most foot traffic in your home is also the one with the most hidden spots that need a good scrubbing. Cobwebs are not exclusive only for the higher corners of the room. You can find them under the sofa, the coffee table and even hidden in the curtains. Altho you may remove some of them periodically during the spring cleaning of your London home you must clean them all. When you are cleaning, the upholstery takes your time and tend to the stains you may find out. Some of them may be old and unwashable, but this doesn’t mean you can try. There are numerous one-off cleaning services that can offer you alternative methods of stain removing and you can always call your local professionals. While we are on the topic of upholstery washing, clean the space under your couch cushions. Use the attachments of your hover to get to the hard-to-reach places. If you have a fireplace, do not hesitate – grab the brush and start scrubbing. Clean the chimney (if you live in a house) while you are at it. Remember, do this before you start vacuuming and mopping the floors. You don’t have to double your chores. Window washing is a tricky task, but since you live in London the weather is in your favour. All cleaning experts say you should wipe your windows only when it is cloudy outside because the direct sunlight keeps you from seeing all of the smudges and spots. The dirtiest place in the house is usually the one in which we eat and prepare our food. It is also the room that is in most danger when it comes to mildew, as it loves rotting food scraps. Defrost your fridge, remove all foods that have gone bad and thoroughly wash it both from the in and outside. The dishwasher is the next kitchen appliance you need to take care of. It may sound unnecessary but once you start you will discover how much waste actually accumulates at the bottom of the machine. Wipe all of your cabinets and drawers from the inside. Clean every shelf, wall and door. When you cook, grease drops have the nasty habit of sticking in the most unusual places. Wash your sink and clean the drain. Remember to wear rubber gloves and a protective mask if you are using strong detergents. The stove and microwave are next. They need to be scraped from the food and oil stains. If you decide that you don’t have the time for this, lots of London cleaners include in their one-off services a deep oven washing. Why don’t you try it? Remove everything from your cabinet and carefully clean it from the inside. We guarantee you will find some nasty things stuck on its shelves and walls. Polish your shower heads and all chrome surfaces, this includes your taps, handles and holders. Get rid of those white watermarks. Remove all hairs from your drains and sanitise them similar to the way you treated the ones in your kitchen. Wash your toothbrush holder and any other bathroom accessory. Clean your toilet bowl brush. This may sound strange but it also needs to be washed now and then. 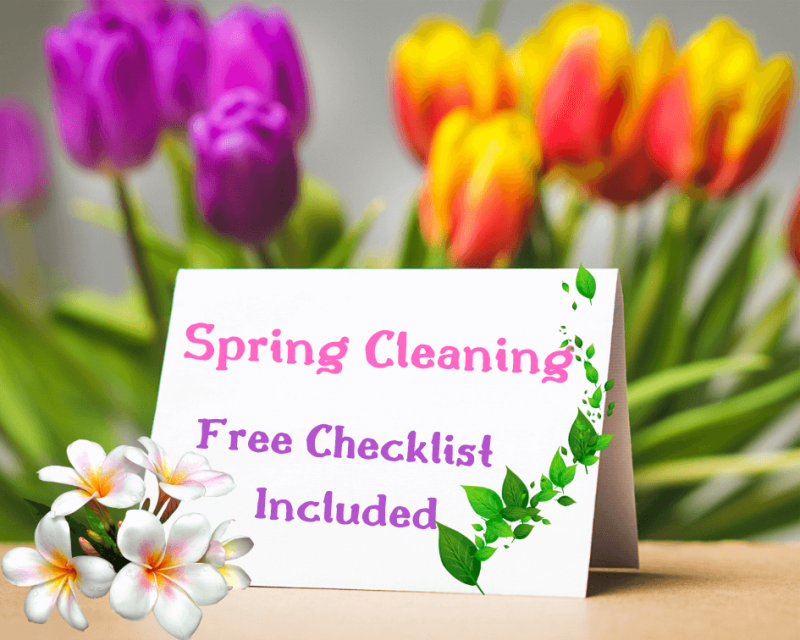 As we promised, get your free Spring cleaning checklist!